Dark Rock Pro 4 contains two aluminium heat sinks. The cutouts provided enhance its RAM compatibility. Two fans are pre-installed. It is also possible to add another 120mm fan for even better cooling. 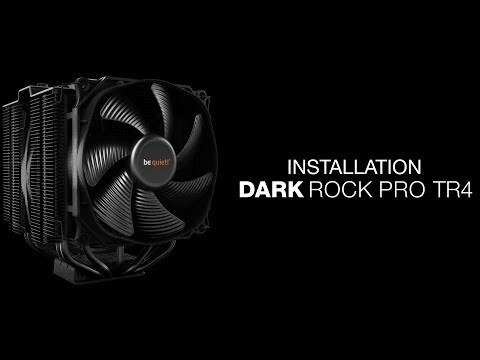 The mounting kit for the Dark Rock Pro 4 cooler is completely black, perfectly matching the black design of the cooler itself. You can conveniently install the cooler on the motherboard from above. The brushed aluminium top cover with its diamond cut finish adds a touch of elegance to this high-end cooler. Features • Two virtually inaudible Silent Wings PWM fans. • Funnel-shaped frame of the front fan for high air pressure. • Achieves only 24.3dB(A) at maximum fan speed. • Seven high-performance copper heat pipes. • Airflow-optimized cooling fins; cutouts enhance the RAM compatibility. • Brushed aluminium top cover with diamond cut finish.